Feeling confident on a newly tuned bike courtesy of City Bikes, I leave my friend’s place in Arlington, VA and ride over to Georgetown to pick up the start of the C&O Canal Towpath. What’s that you say? Introducing the Chesapeake & Ohio Canal Towpath, which follows a shipping route for eastern coal built during a Canal Era race with the railroad to expand west. The railroad won. The canal and the corresponding towpath were abandoned for good in 1924, yet original lock houses and aqueducts remain. Thanks to U.S. Supreme Court Justice William O. Douglas, the federal government stepped in to protect what Douglas called "a long stretch of quiet and peace." The trail today is managed by the National Park Service, but is mostly maintained by Mother Nature. This is the most anticipated segment of my trip. The C&O will guide me 184 miles to Cumberland in western Maryland, climbing only about 600 feet, mostly at lift locks, on its way from Washington up the Potomac. In Cumberland I’ll transfer to the 150-mile Great Allegheny Passage all the way to Pittsburgh. In total, the two trails bless bikers with 335 miles of car-free riding. No cars. No getting lost. No hills (well, almost none). What could be better than flat, non-motorized riding for a clunky bike like this one? Although I imagine this to be the easy part of the trip, I am fearful of one thing: flats. I’m passing through really rural areas and could be 60 miles or more between bike shops. My entry onto the C&O Canal Towpath in Georgetown. This bike is going to get dusty! Crossing into Georgetown, I quickly find an entrance to the C&O—with stairs. Ugh. My awkward descent catches the attention of a guy riding DC's Capital Bikeshare. He’s impressed with my ride but wonders how I’ll fix a flat. He says the path is filled with sharp rocks that have caused two flats on his own wheels. His parting advice kills my euphoria at reaching the C&O: know the location of every bike shop on the route. Into the wilderness I roll, looking forward to the ride yet fearful of the rocks that could derail it. I pass joggers, cyclists, walkers and dog walkers. A group of guys paddle board on the canal’s motionless water. As I’m keeping an eye out on trouble, I notice a parallel but paved path. What is this and how do I get on it? When the trails narrow to within six feet, I jump at the chance. 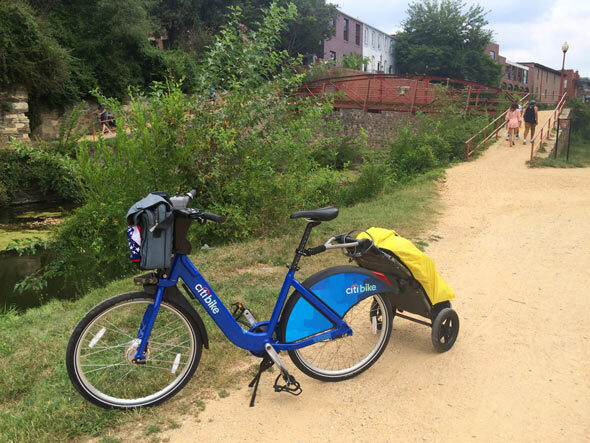 I unhitch Travoy and guide Countri Bike down a grassy slope and continue along what I later learn is the Capital Crescent Trail. The smooth surface is delightful. I lose sight of the C&O and pass over a major road. Uh-oh. Google Maps shows the two trails reconnecting down the line, so I pedal on and enter Montgomery County. A family of deer jump out of the bushes. Bambi is cute, but my gut tells me to recheck Maps. I've missed the C&O turnoff miles ago and am heading straight for Bethesda. Waste time and reverse course over smooth trails or press ahead on local hilly roads? I head for the hills. I pass a strip mall with an Asian bistro and wonder if this is my last chance for food tonight. There aren’t any trail towns before Harpers Ferry at mile 60.7. I’m camping halfway up to Harpers Ferry with only gummy bears, protein bars and some chips. Between getting a late start out of Arlington and my detour towards Bethesda, I’m behind schedule and need to hustle. Luckily, Countri Bike is holding its own on rocky roads and navigates through mud with no problem. We’re eating up this trail. You know what? I’m happy to have this bike. Countri Bike’s thick tires are a magical shield that packed gravel cannot penetrate. The bike is holding its own and pulling Travoy smoothly. I don’t even notice I’m towing a trailer. I feel a 180 degree change from my first day plodding over broken glass in Point Pleasant Beach, NJ. My goal is Turtle Run Campground at mile 35.5. It’s a fitting destination considering I feel about as fast as a turtle running on this bike. As I progress upstream, people on the trail dwindle. Butterflies keep me company, dancing alongside as I ride. Other insects execute kamikaze dive bombs, bounding off my cheeks, shoulders and sunglasses. By 5 PM the gnats are out in full force, aimlessly swarming in one place. I absorb them by the mouthful. My skin glistens with sweat in the humidity, turning me into a self-propelled bug catcher. I crash through spiderwebs and feel their sticky threads in my hair; I almost crash the bike trying to flick a Halloween-sized spider off my shorts. Being covered in bugs is disgusting, but I’m more worried about the fading daylight. I reach Turtle Run in time, but relief is short-lived when I realize that I’m not alone.